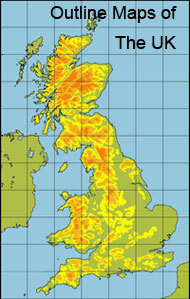 If you found these web pages useful consider making a donation for their upkeep. 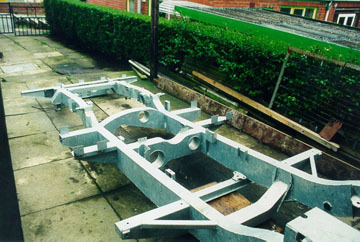 The shiny new chassis arrived and it took four of us to carry it up the drive in front of the garage. 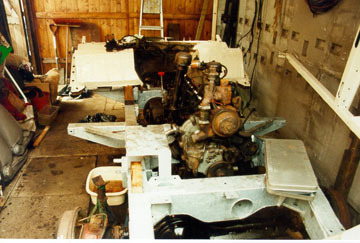 Looking over the new chassis I realised that the old one had been closer to a IIa chassis, the main difference probably being how the exhaust fitted. 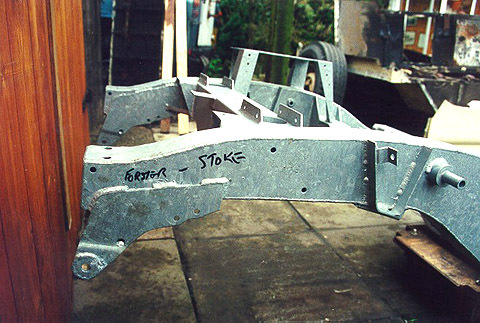 On a IIa 109" the pipe comes out under the chassis and goes under it to the back, whereas on a Series III it comes over the bell-housing crossmember then through a hole in the next cross-member. 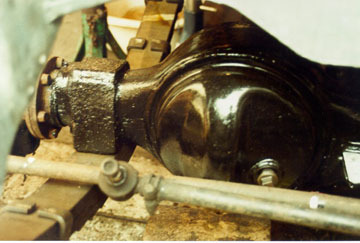 The brake pipe fixings are in a different place too. 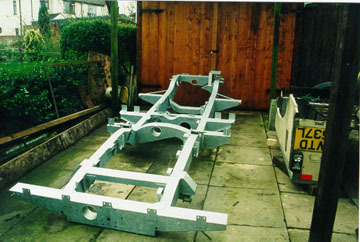 Once the chassis was in the garage and on axle stands the other bits were brought in out of the weather. 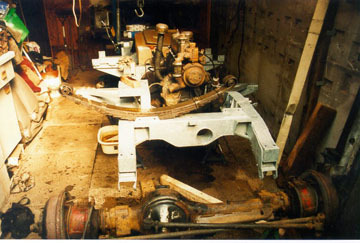 The gearbox was placed on the back of the chassis on lumps of timber to give more floor space for the engine hoist to be wheeled about and the bulkhead was put by the garage doors. 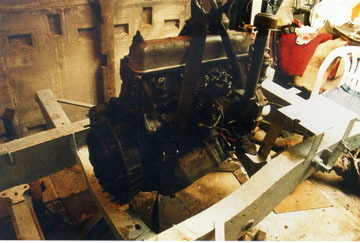 The engine was hoisted into place with a piece of wood under the flywheel housing. 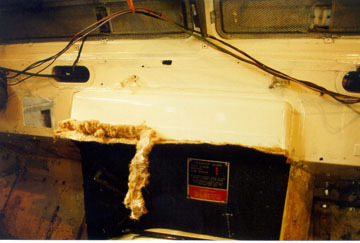 The bulkhead, mainly footwells and door posts were cleaned with a wire brush and then the footwells coated with fibre-glass and resin to both strenthen them and as a rust protection measure, then the bulkhead was painted. 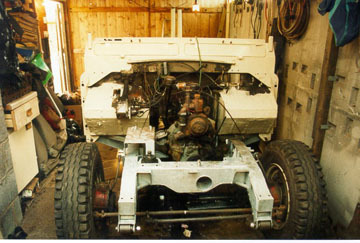 The front springs and front axle were the next to go on. 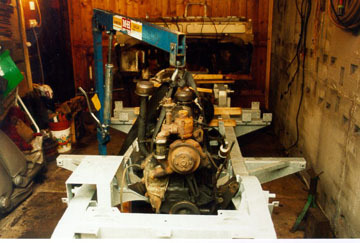 The gearbox was hoisted into place, a much simpler job without a body on the chassis. 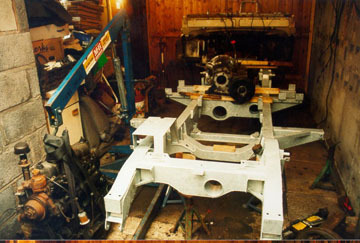 Next the bulkhead was fitted in position and the rear axle given its final coat of chassis black paint. 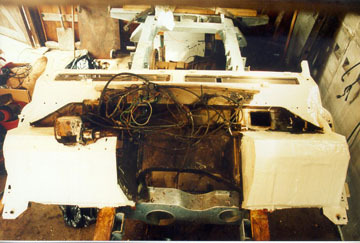 At this stage a piece of the sound deadening material was cut and fitted to the bulkhead above the bellhousing. some of the fibre had to be cut away to fit the trim bar at the top of it. 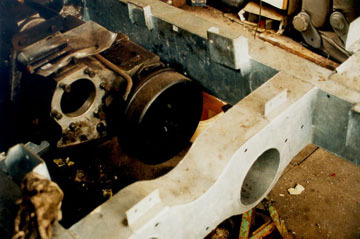 The vin plate and plate showing how the transfer gear leaver works were screwed on through the sheet. 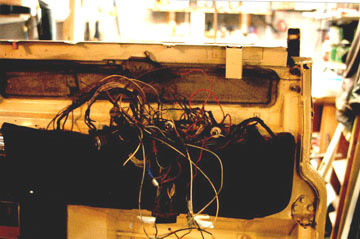 The original wiring loom around the dash and through the bulkhead was kept. 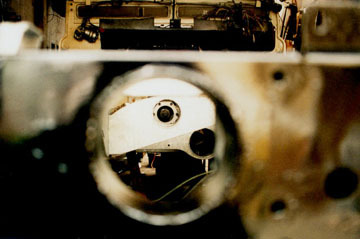 The dashboard is made up of two main sections, the top one going the full width of the vehicle, and the lower one covering the heater/air square hole and then onto the right hand end. This lower one is like a box tube with vents in the bottom of it which are heater outlets and holes in the top where tubes go to allow the heated air up to the windscreen through the top section of the dash. 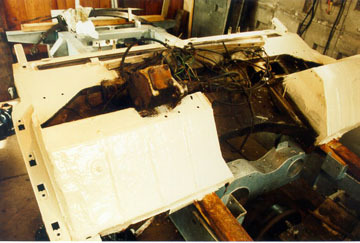 There is a curved part to the bottom section which is a cover for the windscreen wiper motor on the left hand side. I had put labels on most of the wires in the wiring loom, but it was still a struggle sorting them all out. The wiring diagram in the manual is quite good but since I had fitted an alternator to replace the dynamo some of the ignition switch wiring is different and a mix of more than one diagram. I also wanted to fit an ammeter which made things a bit more complex. 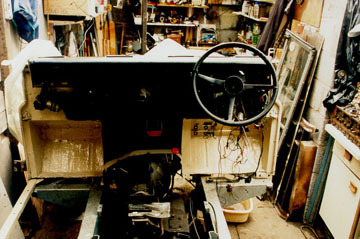 The dashboard was finally fitted and the steering wheel put on to see how it looked. 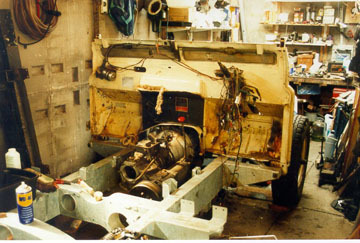 A length of 7-core cable, normally used for trailer lights was used to go through the chassis for the rear lights. 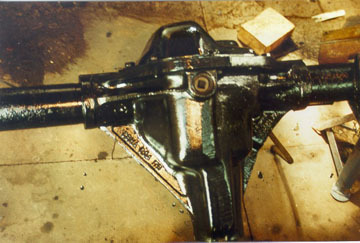 At the back of the gearbox the six bolts are where the overdrive fits, this is also where a rear power take-off shaft would be attached, which is why there are holes going through the cross members including the rear cross member.